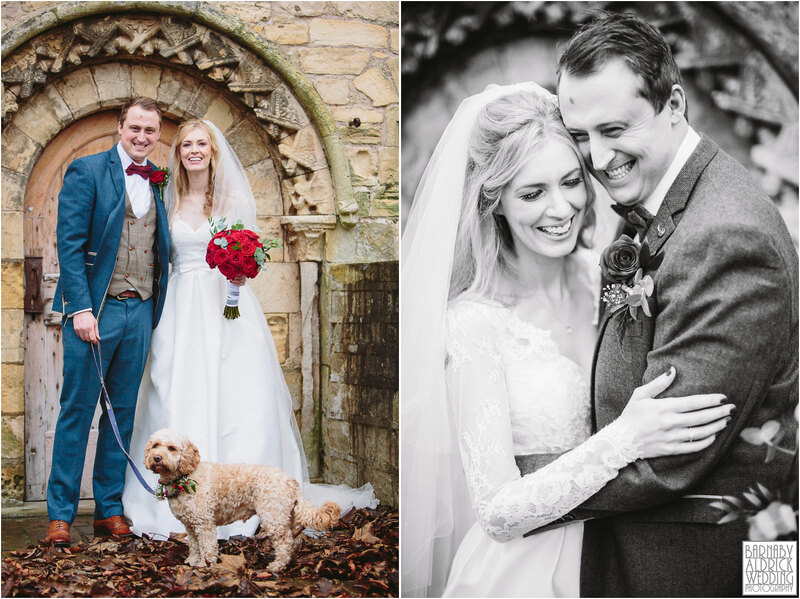 On Saturday I had the pleasure of joining Colette + Adam for their wedding photos at The Priory in Syninthwiate, a stunning barn and marquee wedding venue on a working farm near Wetherby in Yorkshire! 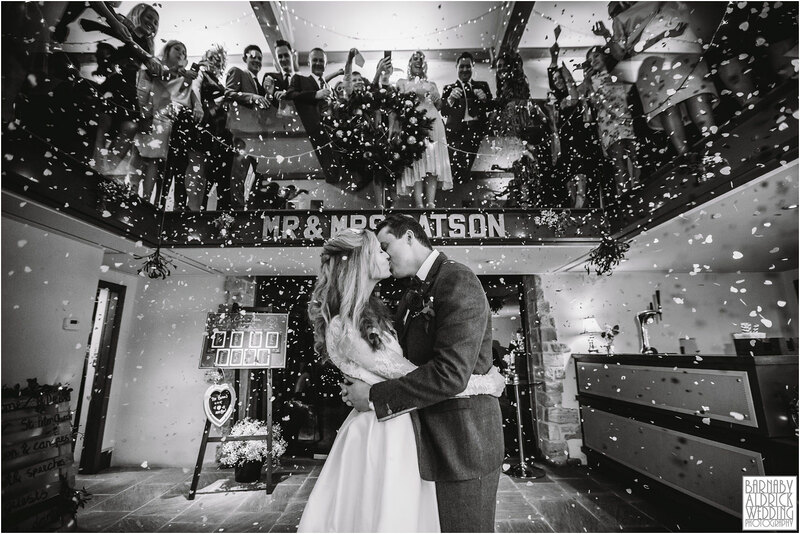 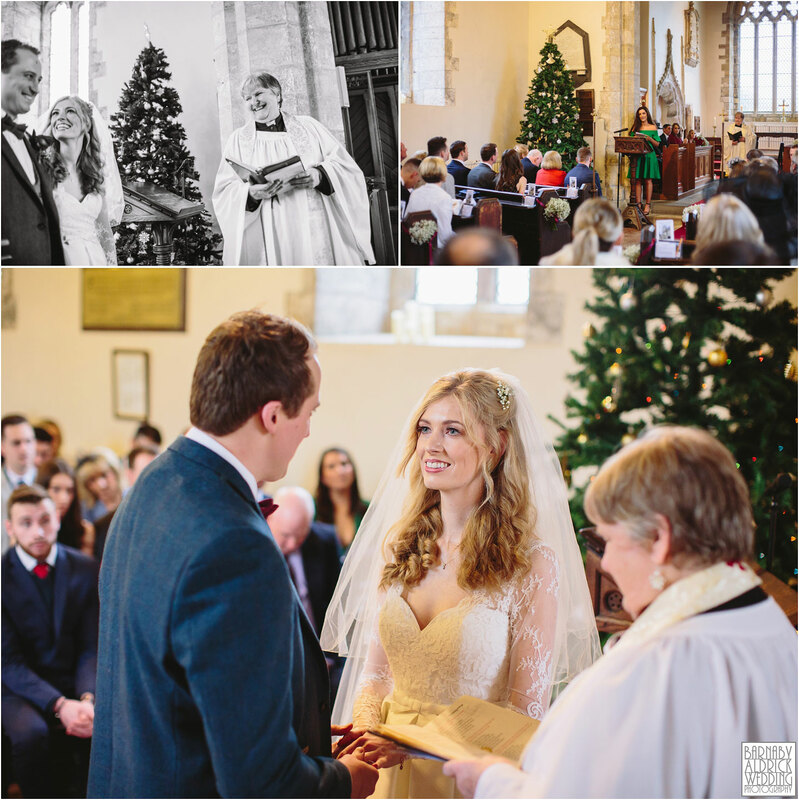 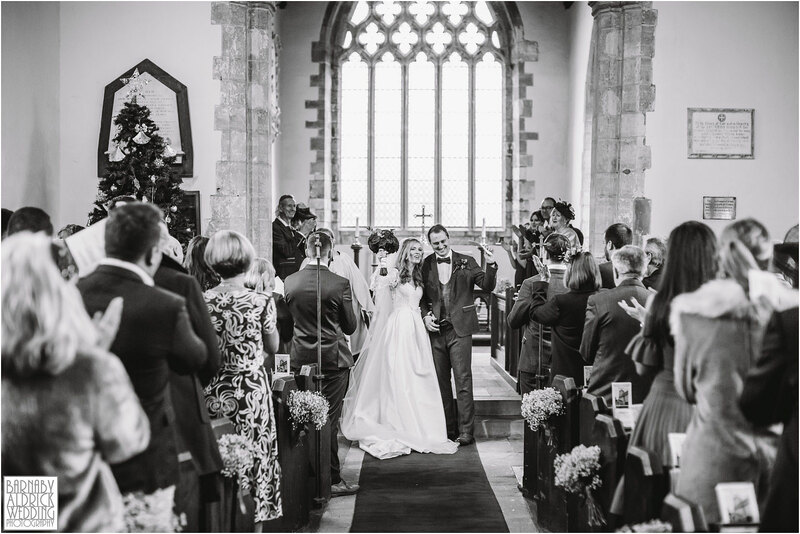 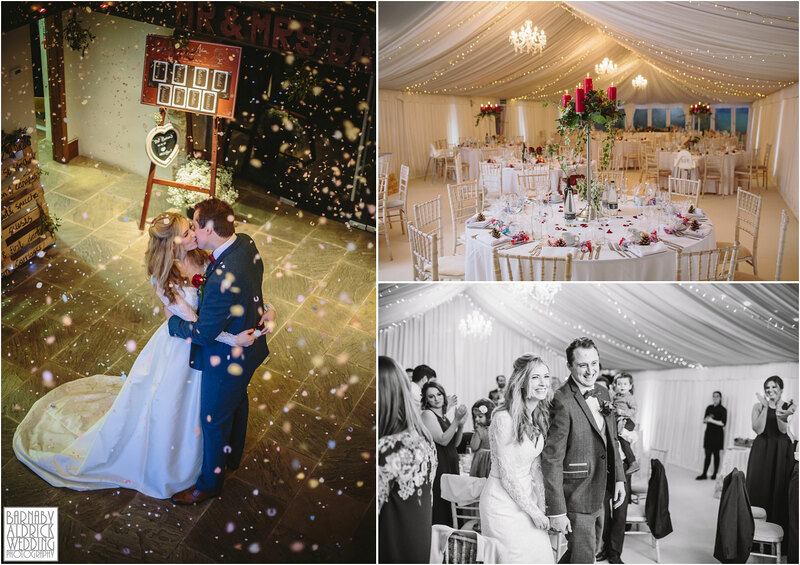 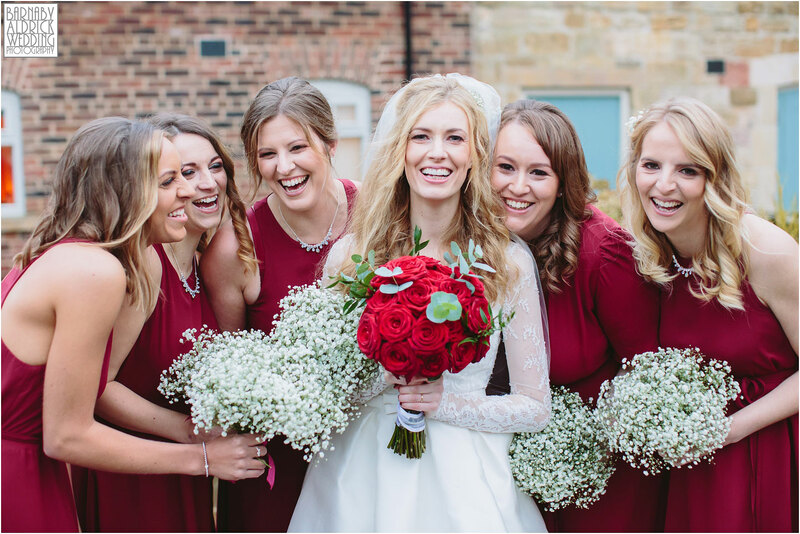 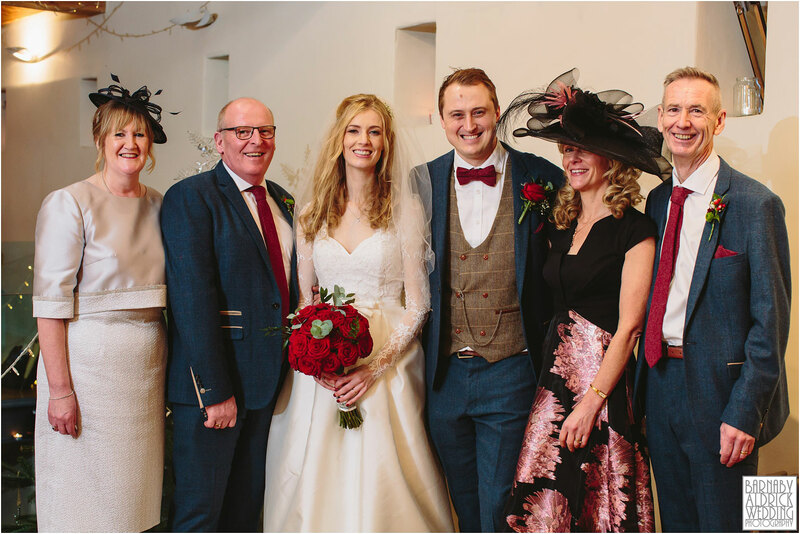 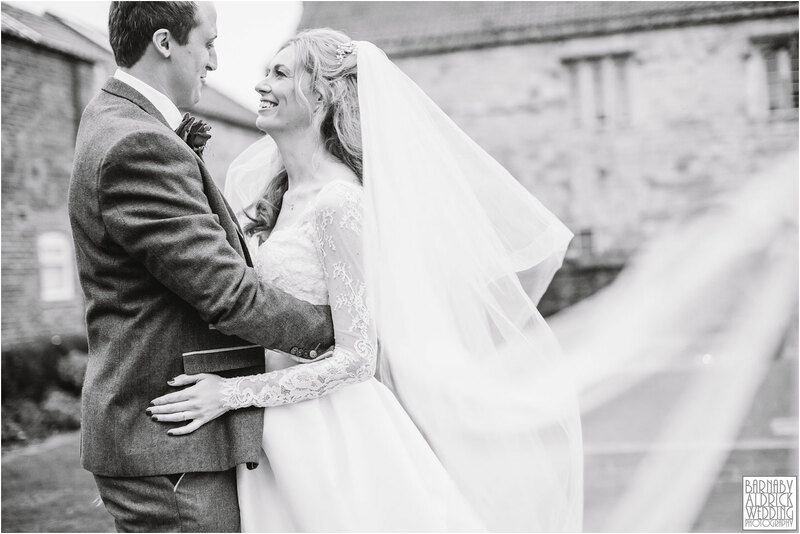 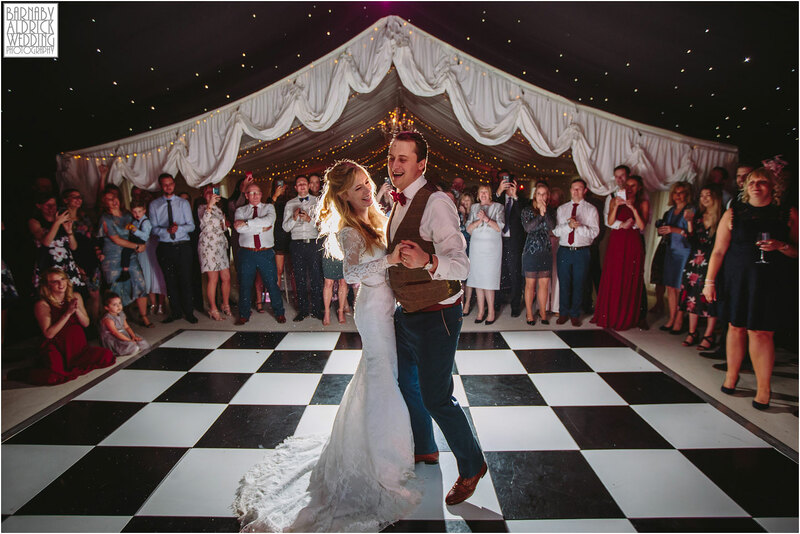 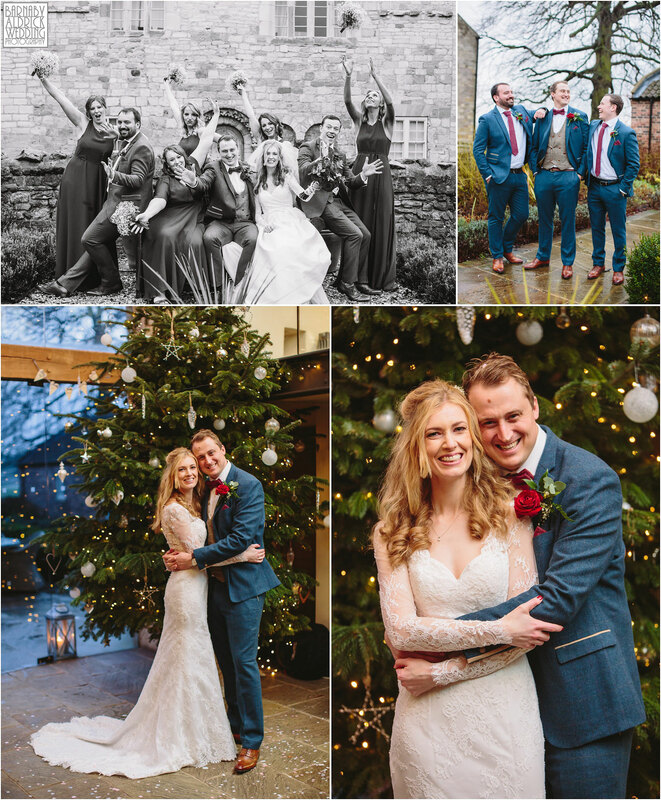 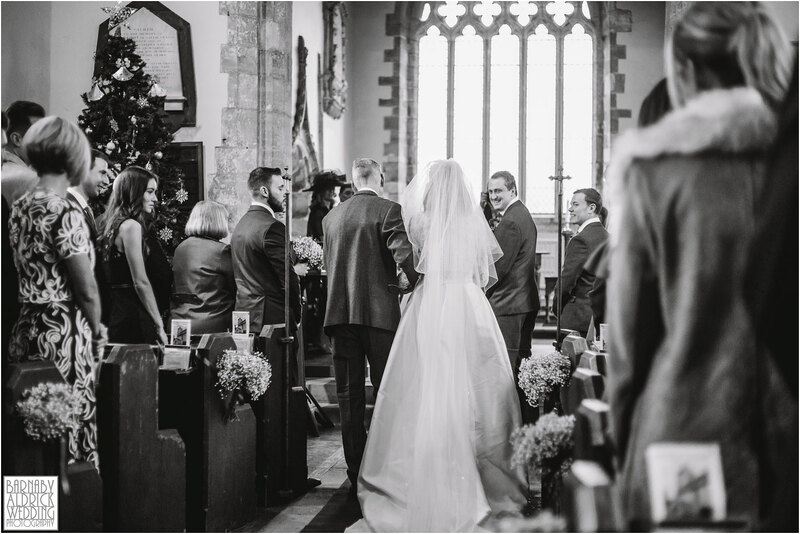 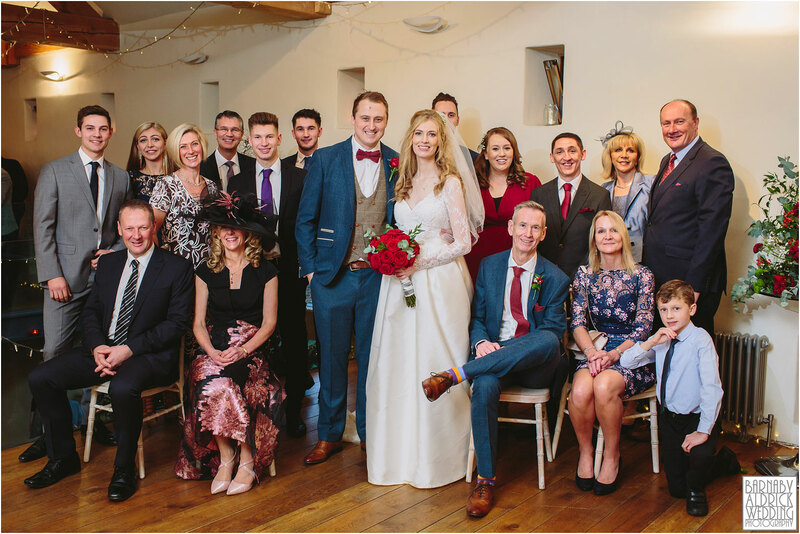 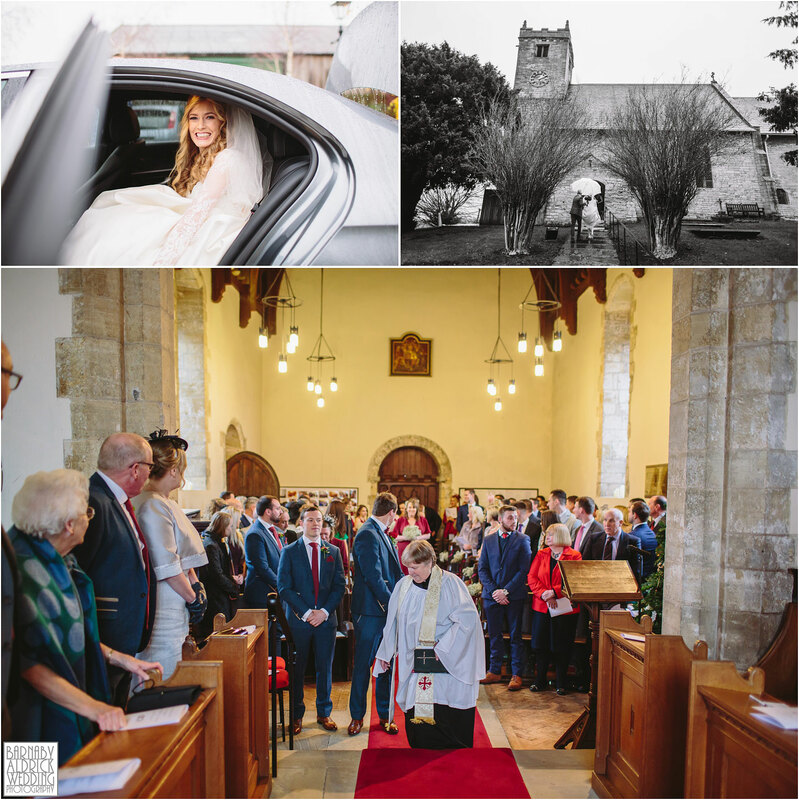 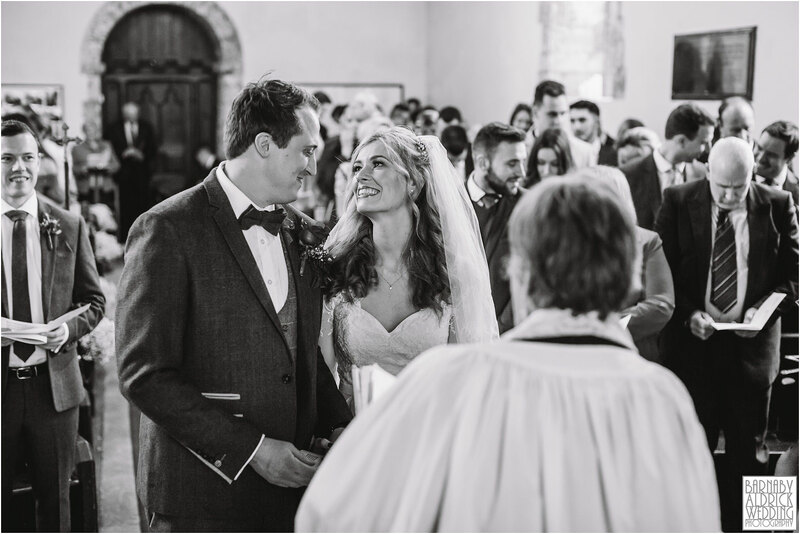 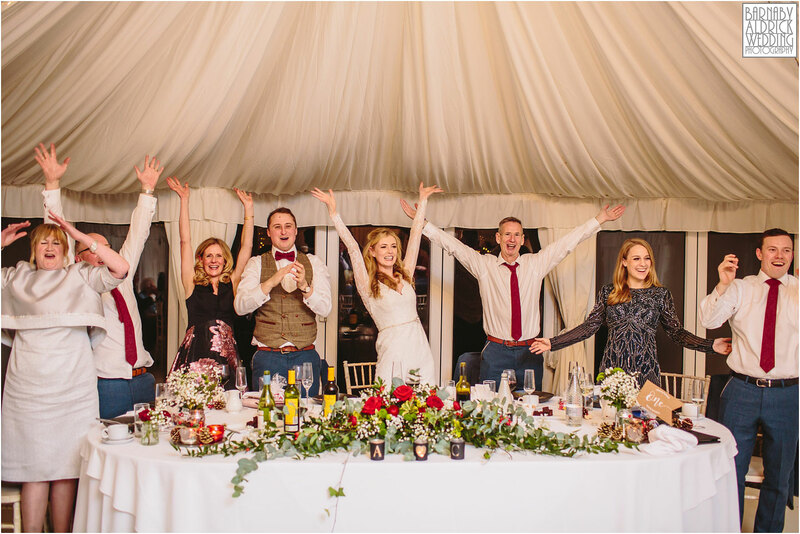 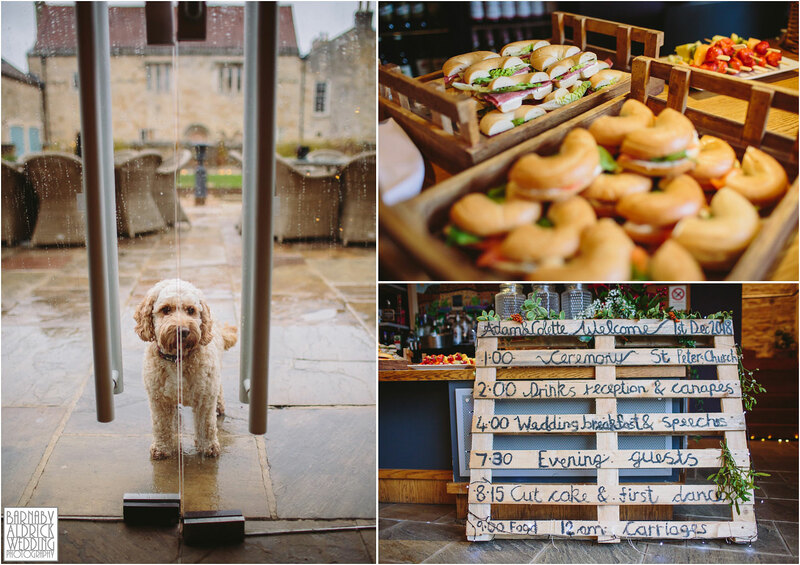 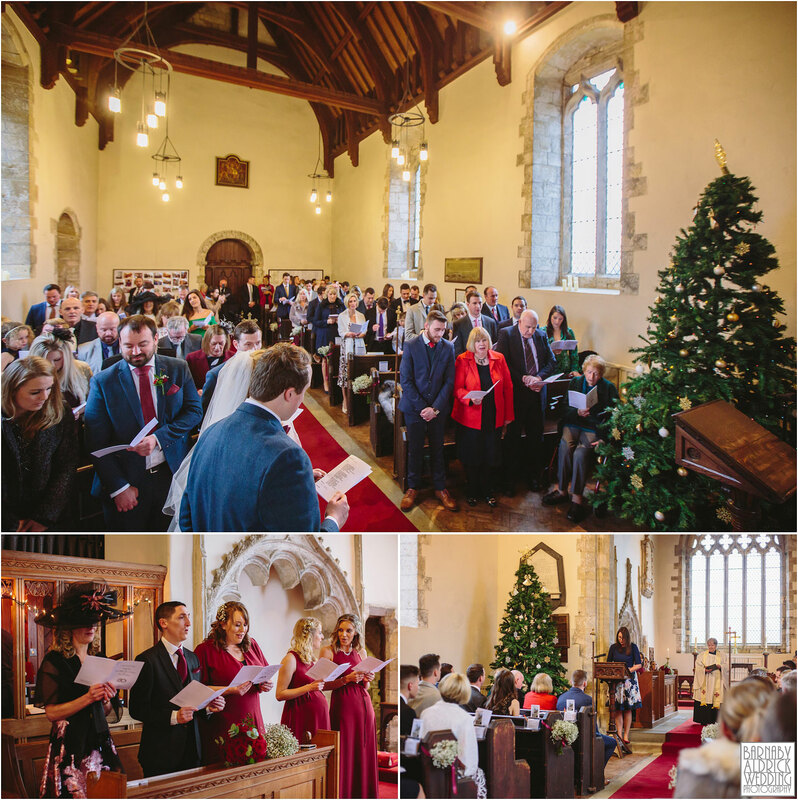 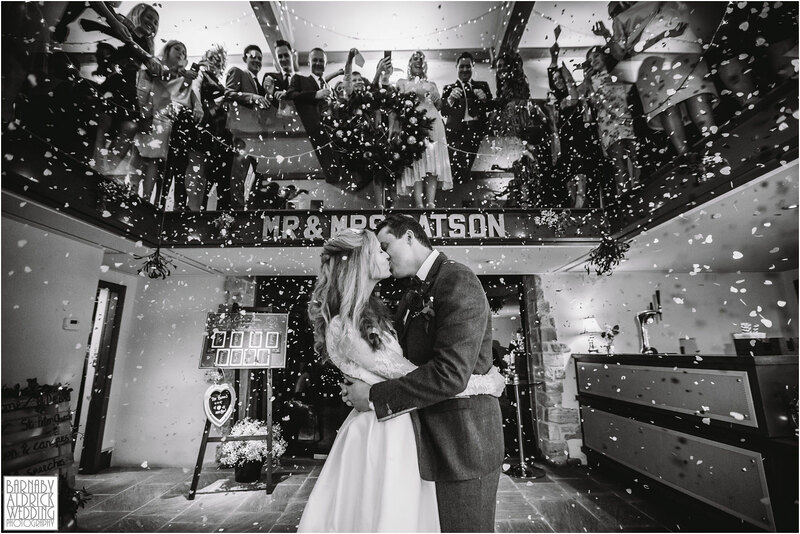 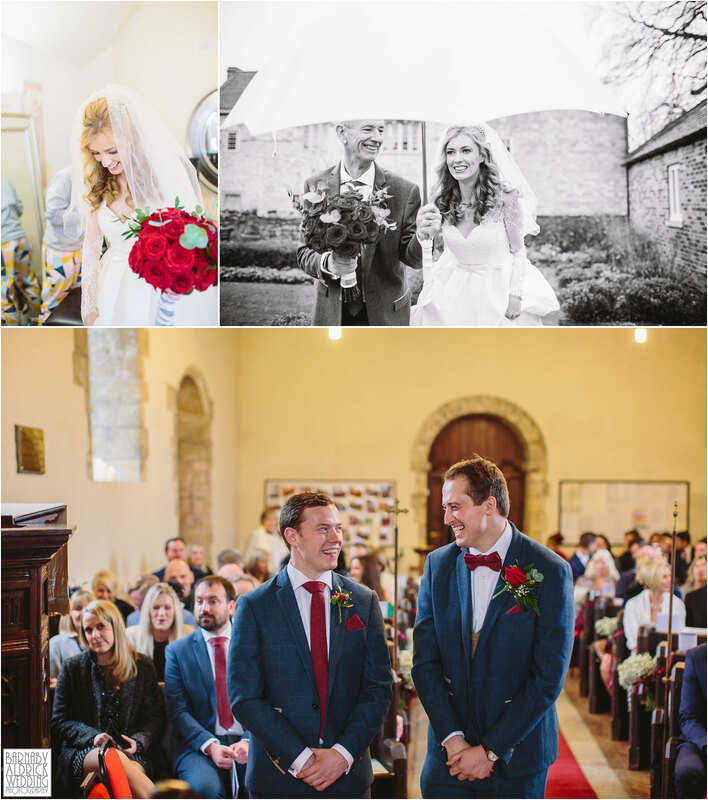 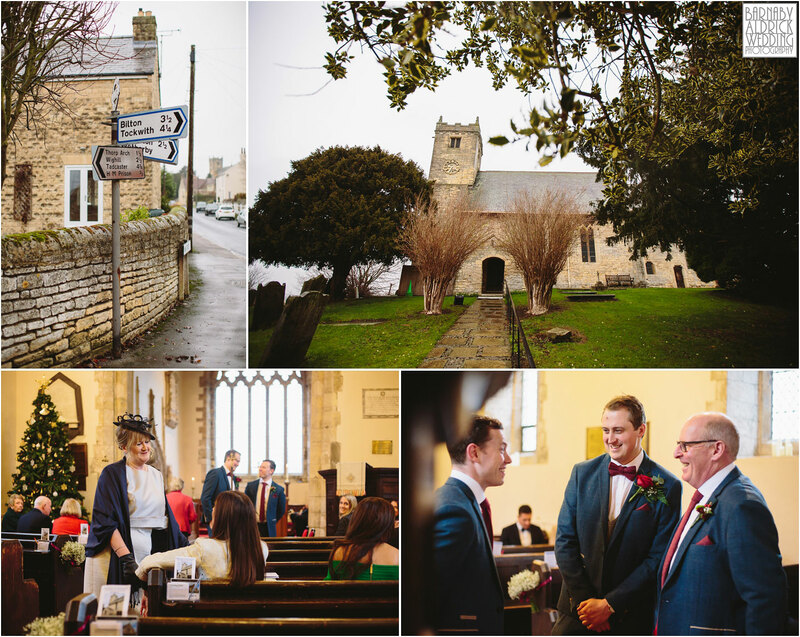 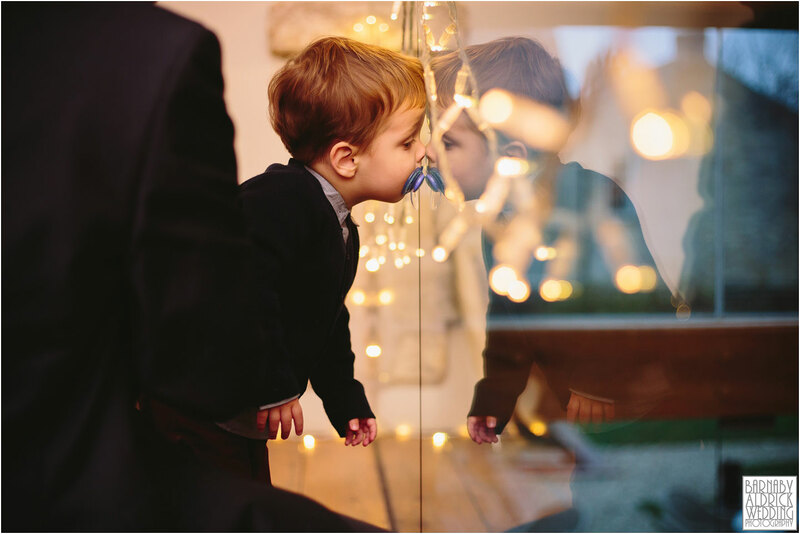 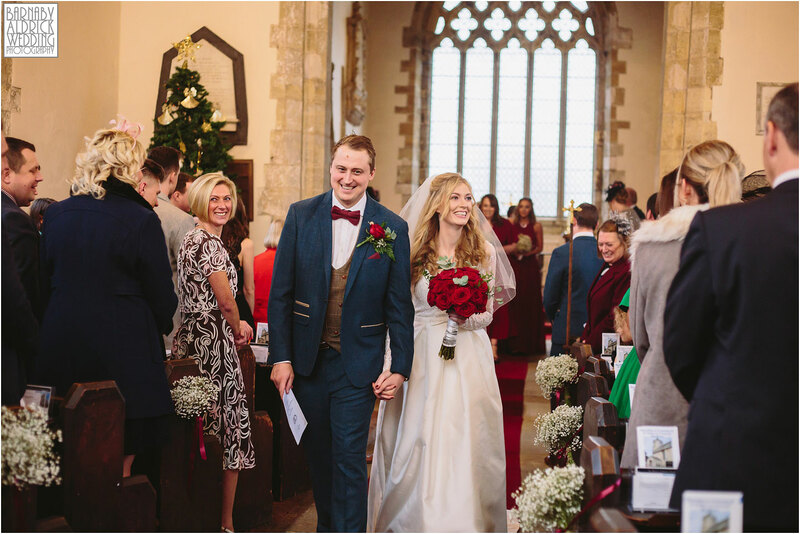 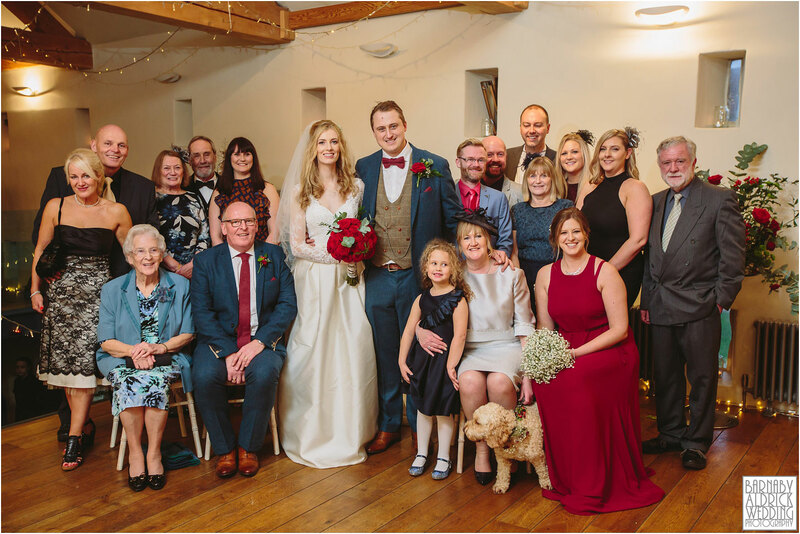 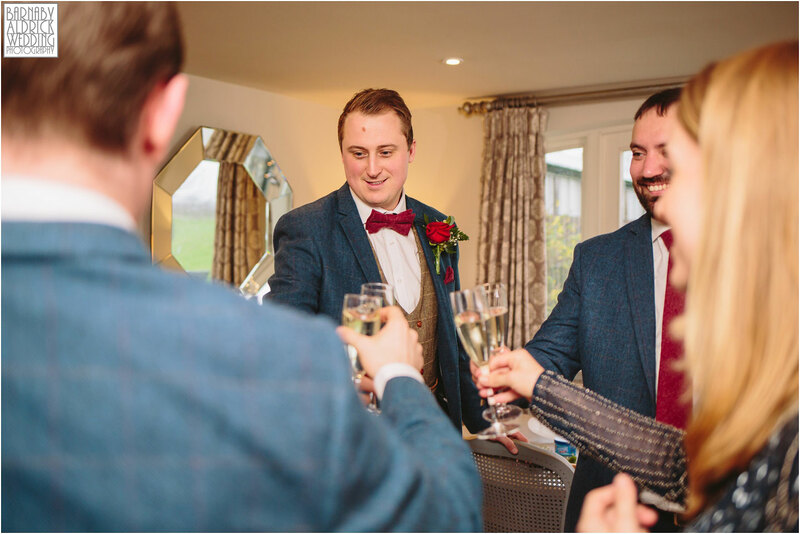 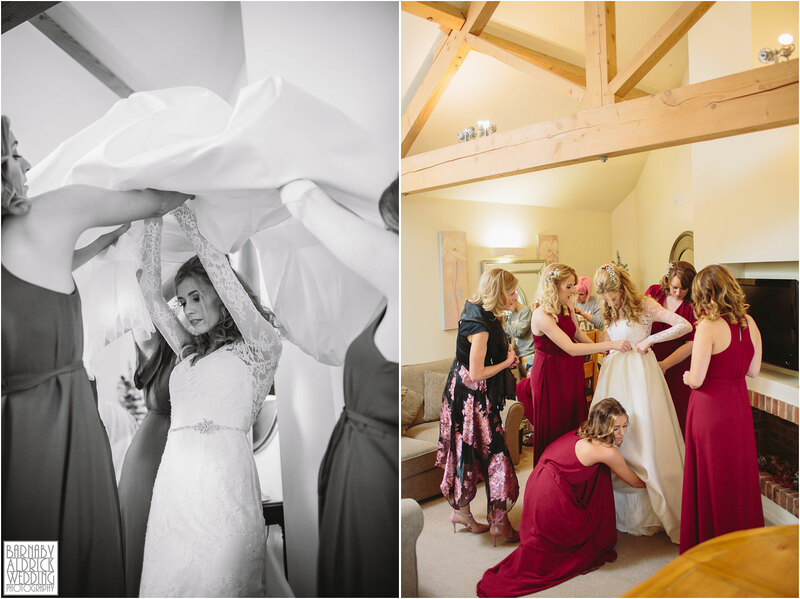 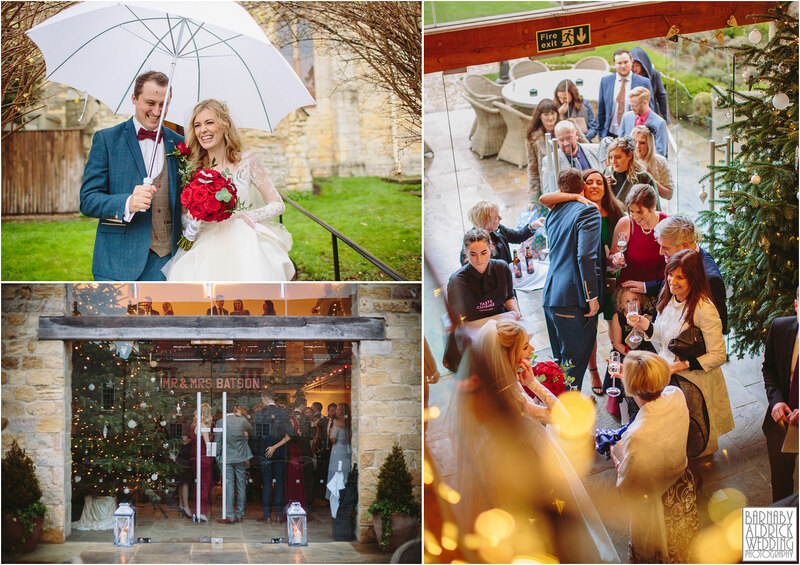 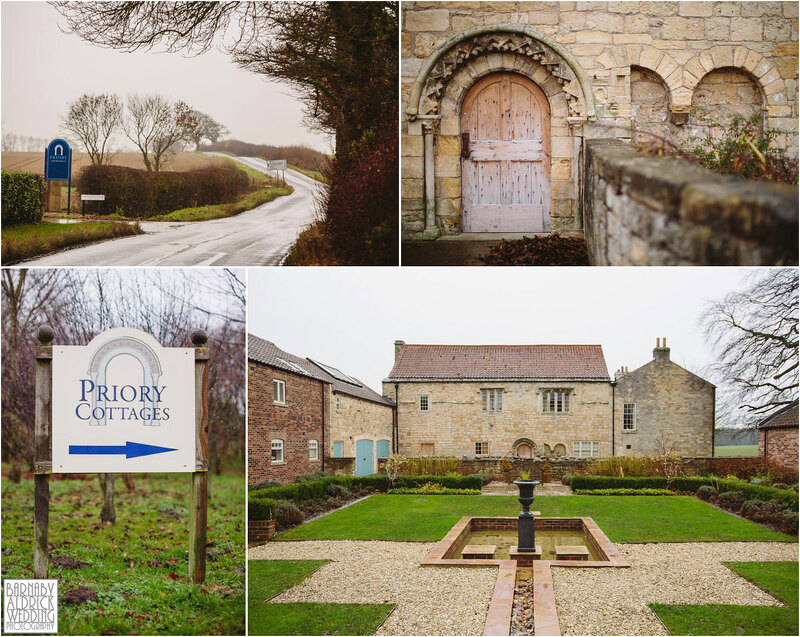 It was one of those grey wintery days with an ominous forecast, but that didn’t dampen the spirits at this wonderful wedding at Priory Cottages! 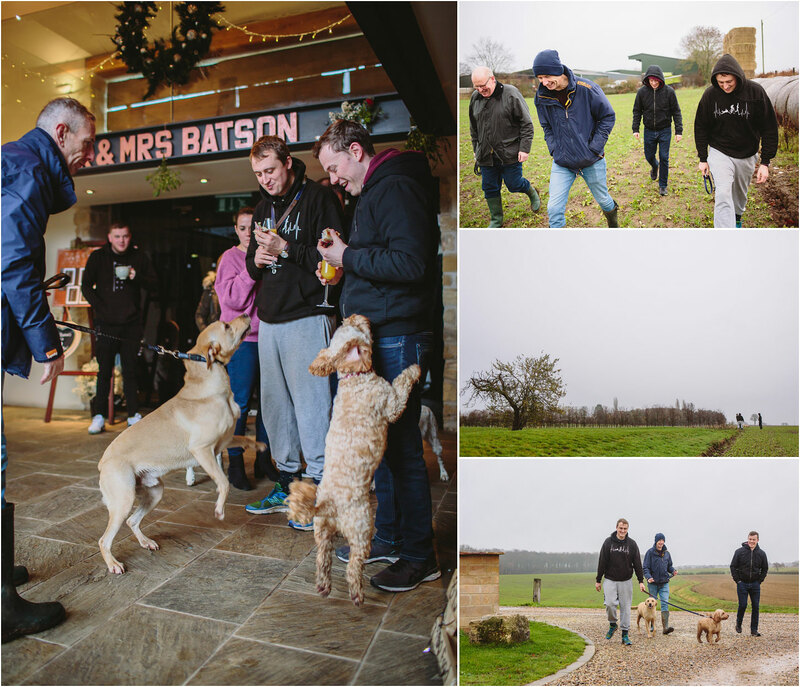 Loads of fun was had over a relaxed morning in the cottages by Team Bride and Team Groom. 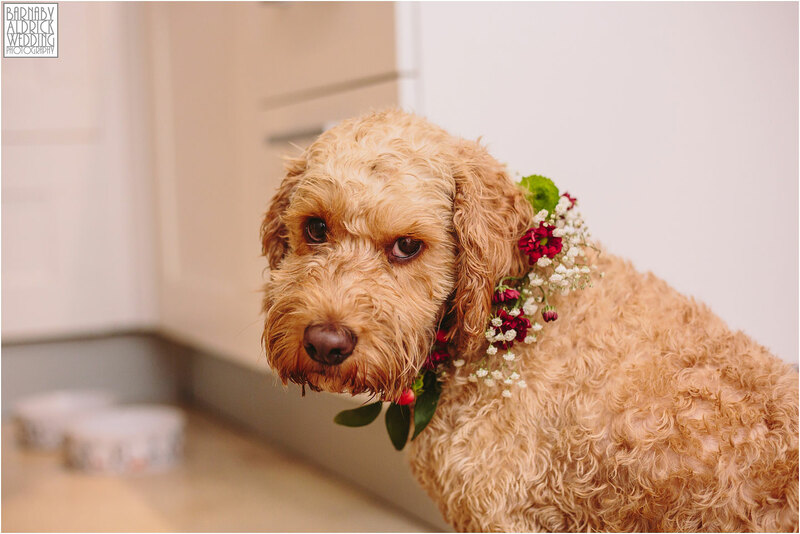 Their little pooch Digger had a right ol’mucky bomb about the farm fields on a stroll with the chaps before smartening up in his pretty garland necklace! 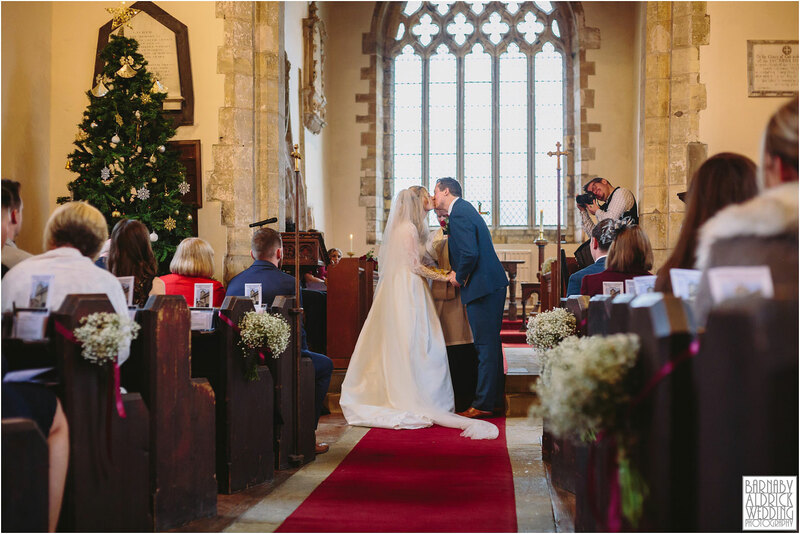 The church ceremony was at St Peter’s Church in the nearby village of Walton (It’s officially Christmas-time for me when carols are sung at a wedding!). 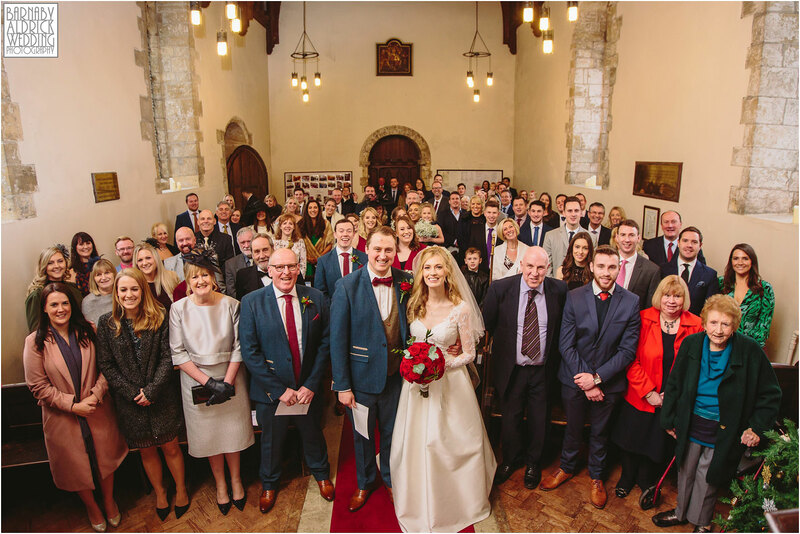 Afterwards we managed to squeeze off a dry photo of everyone in the church before heading back to the Priory for delicious reception drinks and nibbles by Taste Cuisine. 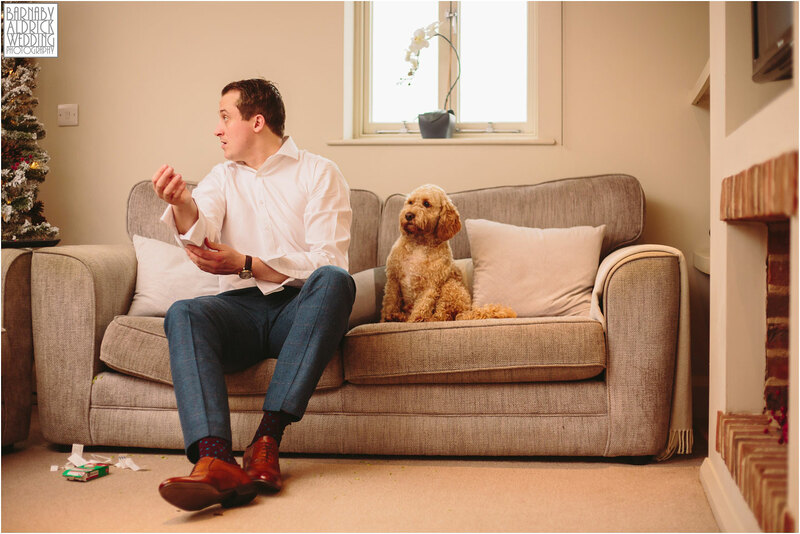 After family groups, we managed to wrangle a quick dry spell and do some portraits (with the pooch, obvs!) 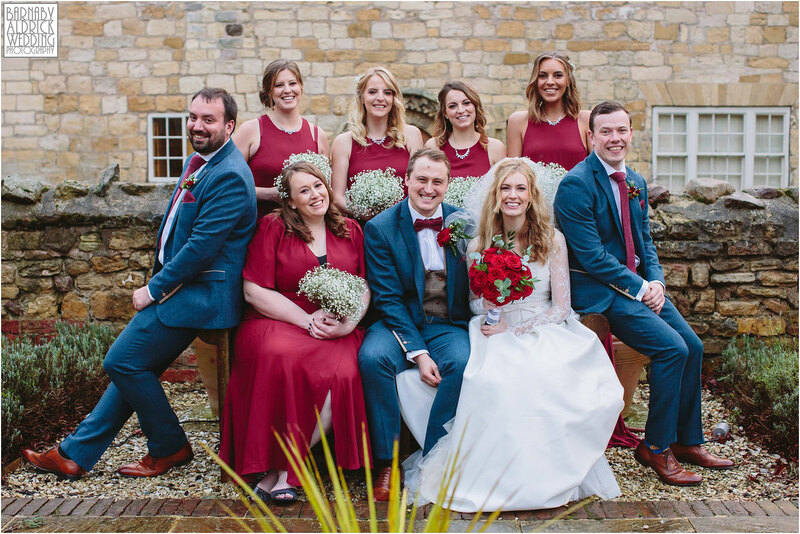 and wedding party teamshots, before the classic Priory Cottages confetti shot with guests on the balcony above! 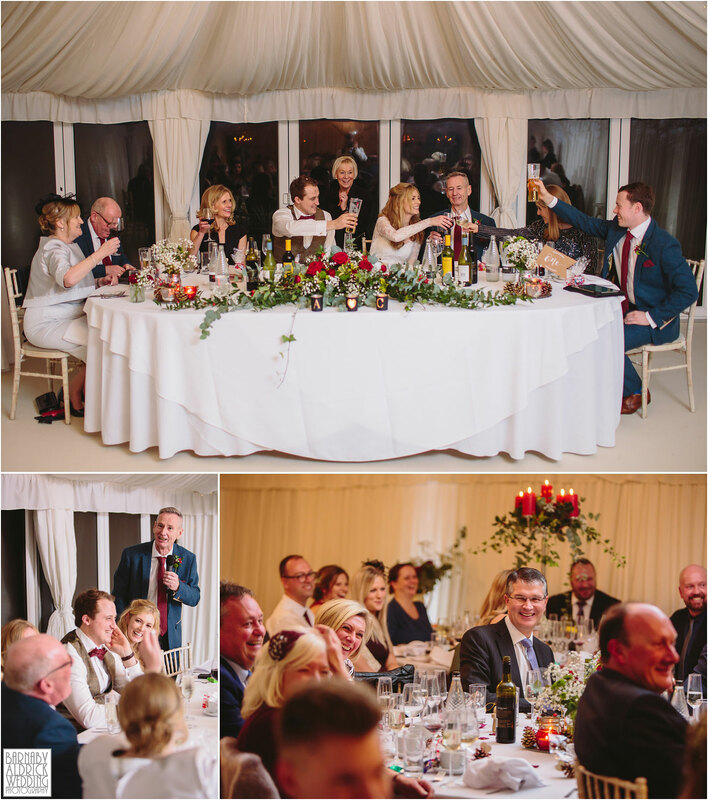 The wedding marquee was brilliantly decked with flora dripping from candelabras (done by their talented mum and dad! 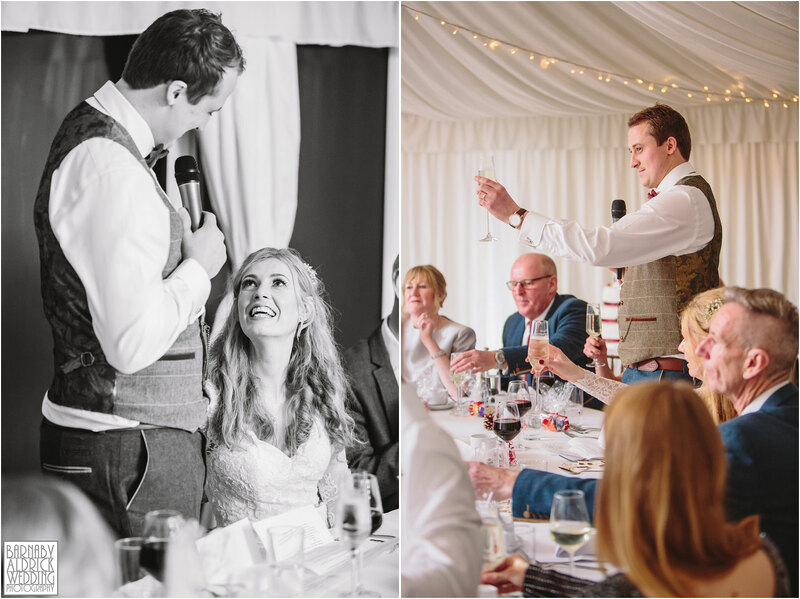 ), then it was time to enjoy fun speeches and delicious grub. 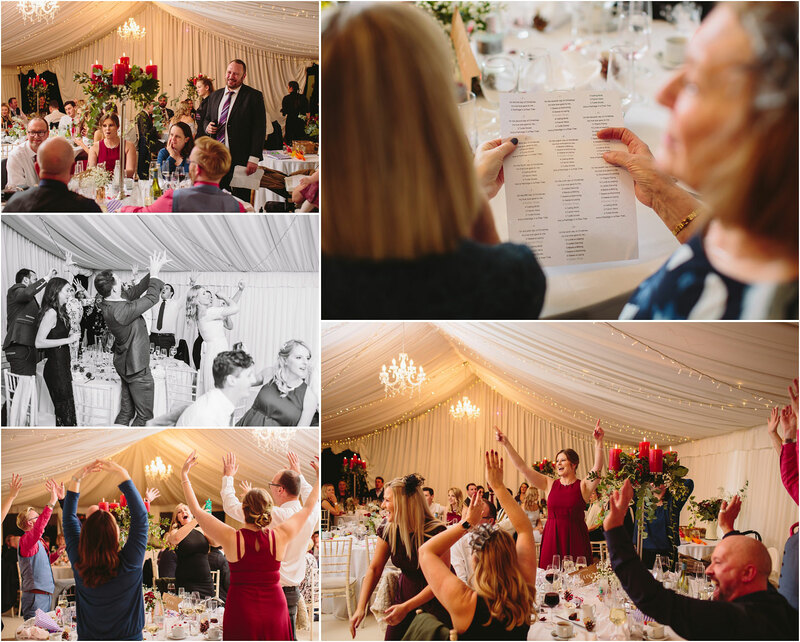 As food coma’s set in, one of their gobby pals handed out the words to the 12 days of Christmas, split the room into 12 groups and made them stand and sing their respective parts, which was a chaotically hilarious success! 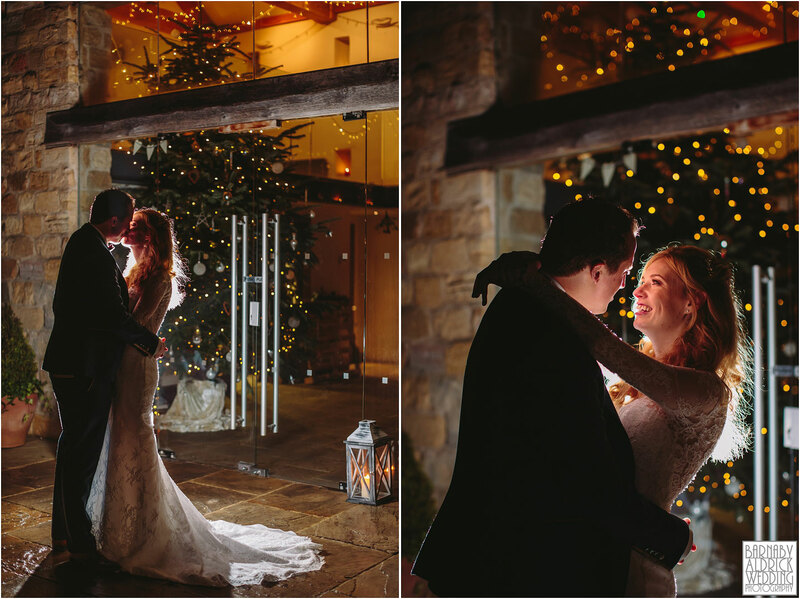 Before long, it darkness set in, and a quick dress change (cunning use of two dress parts, so one could get a bit mucky during the day!) 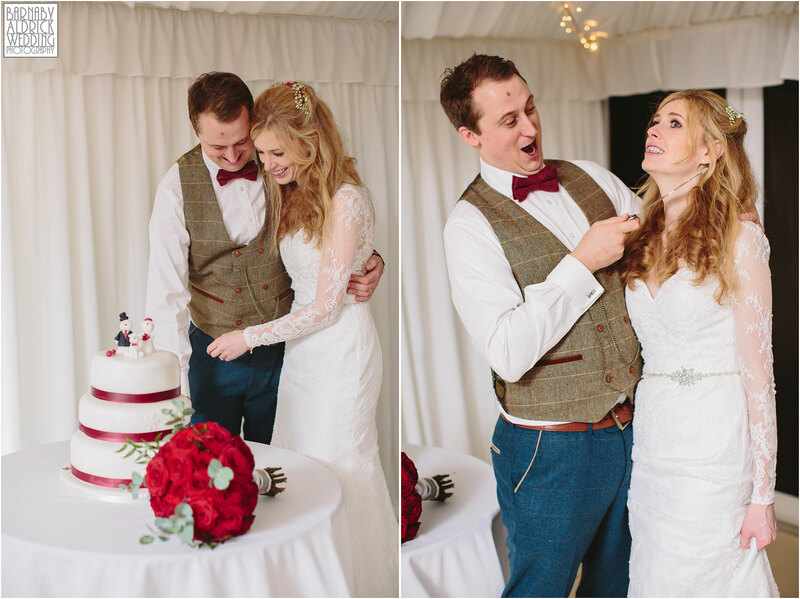 and it was time to cut the cake, dance and be merry! 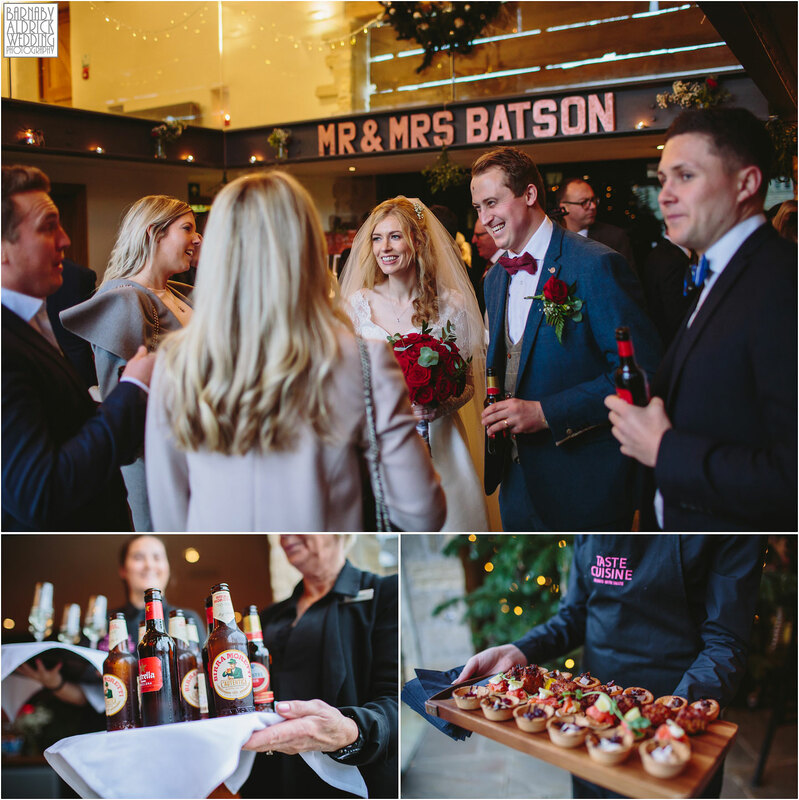 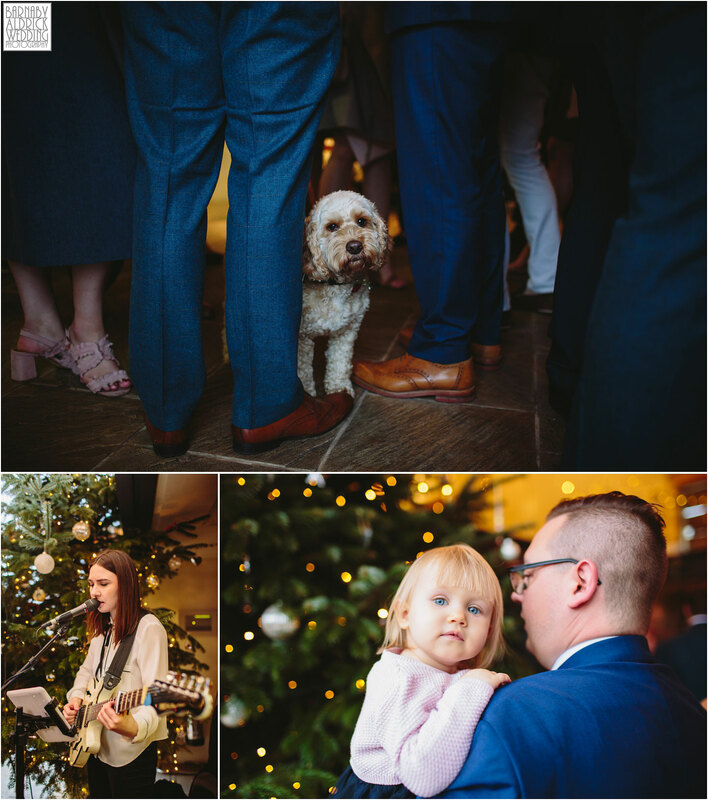 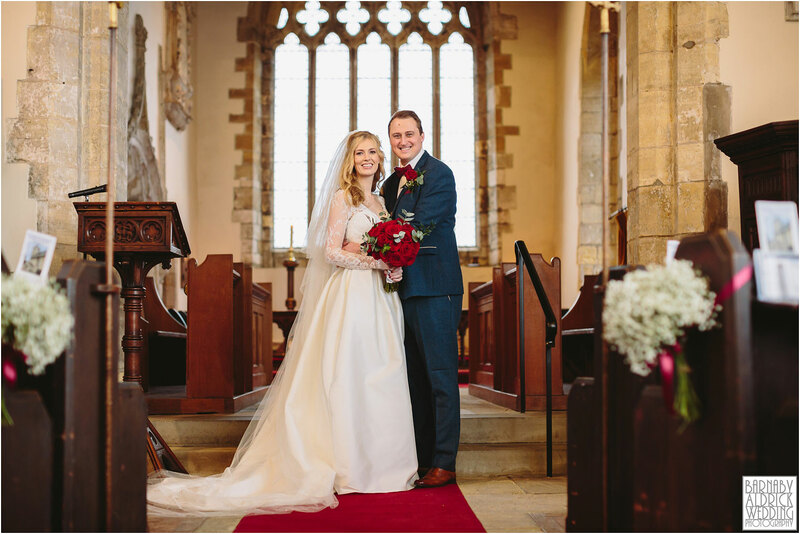 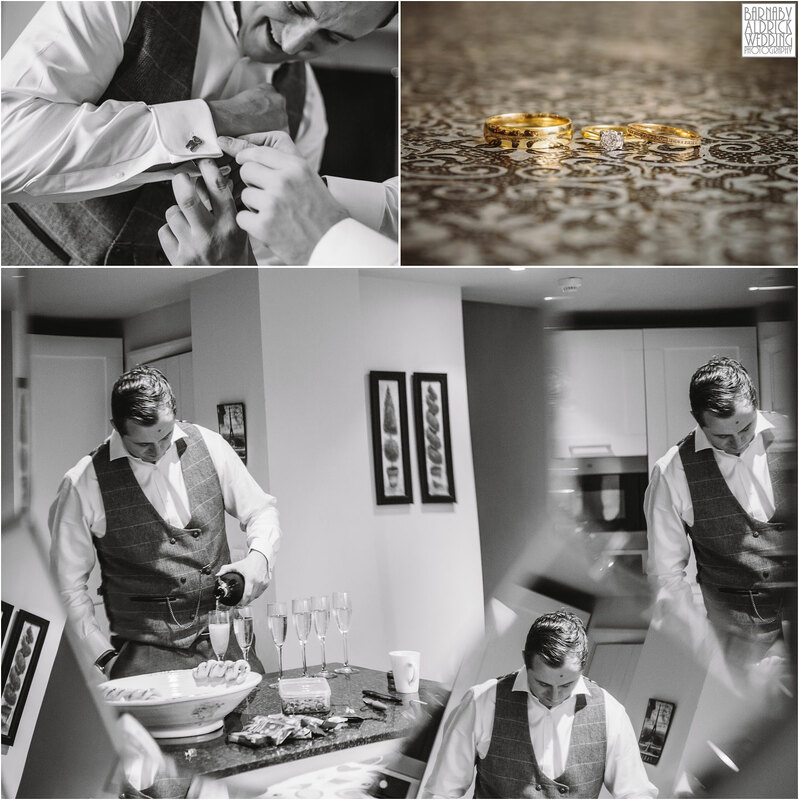 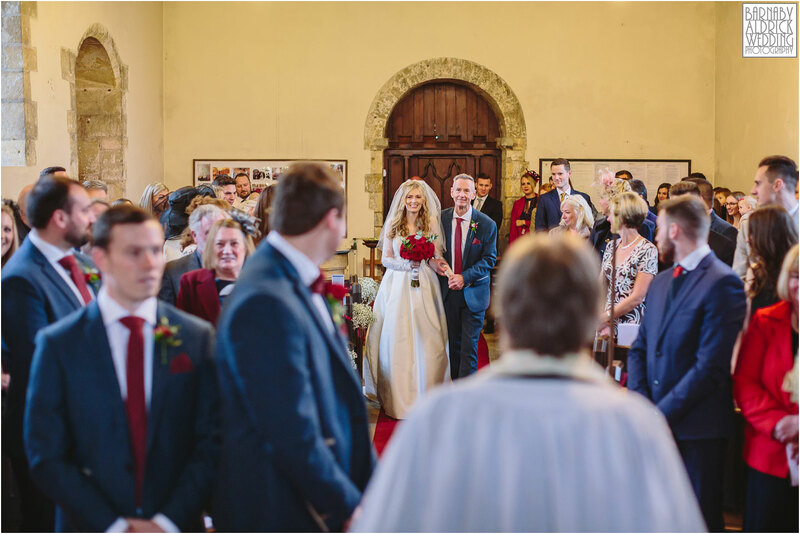 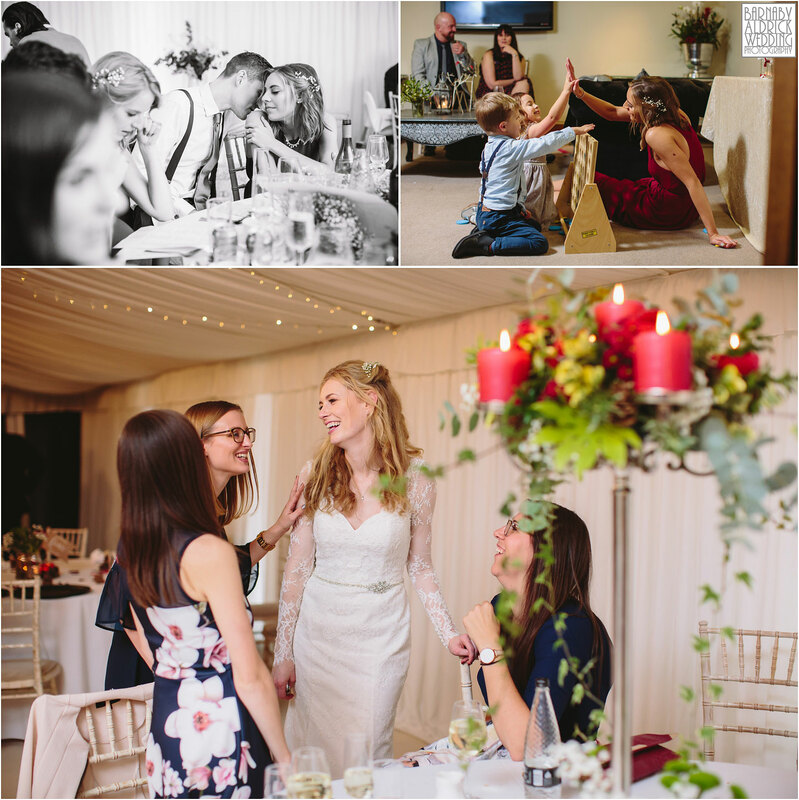 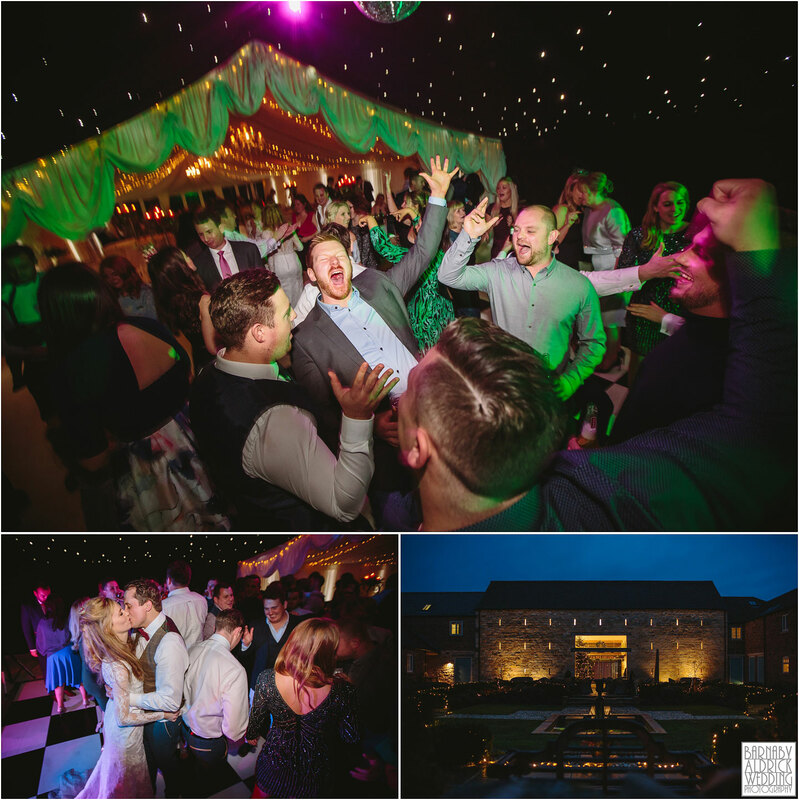 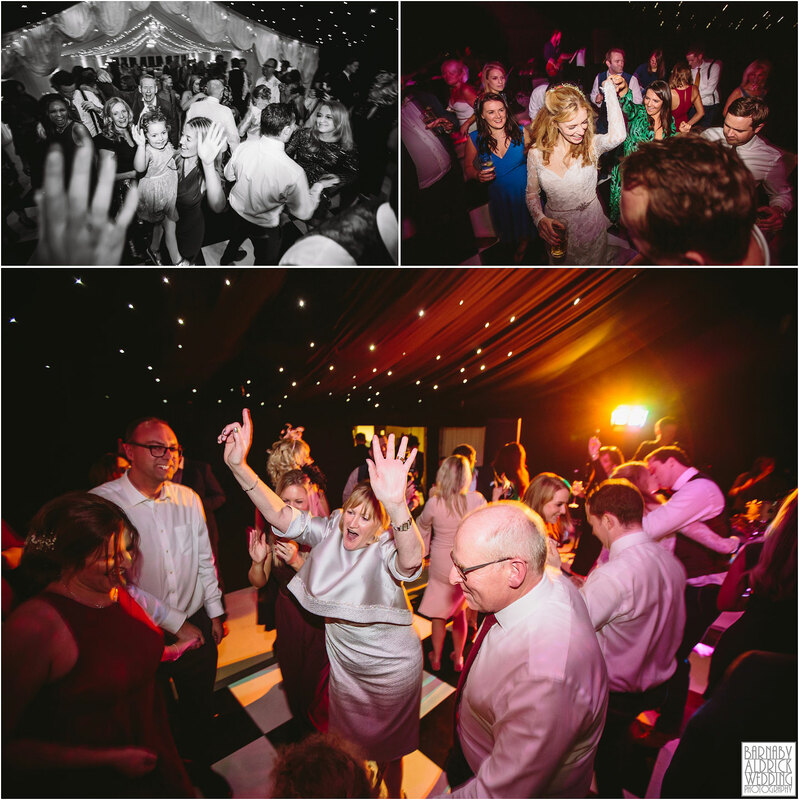 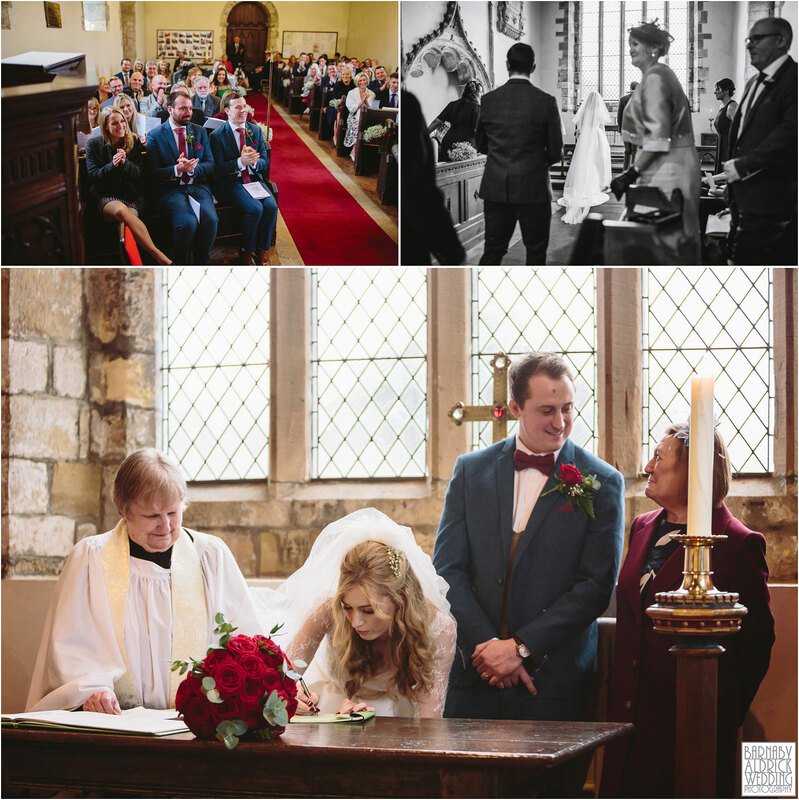 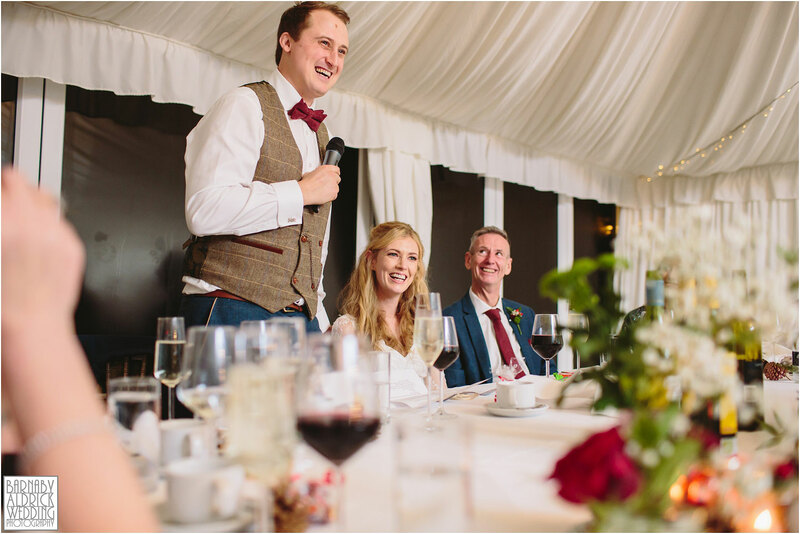 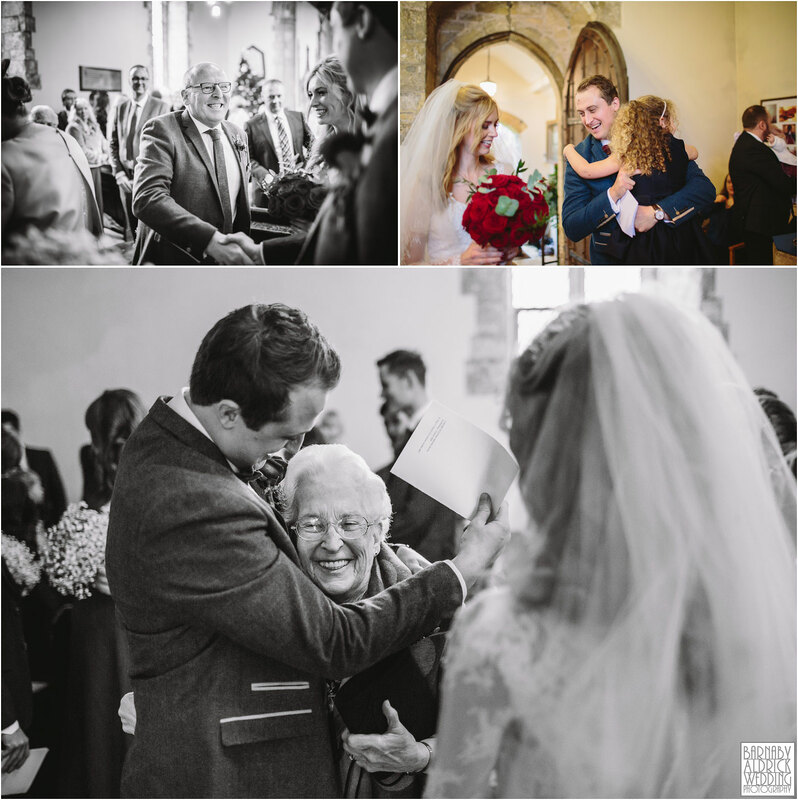 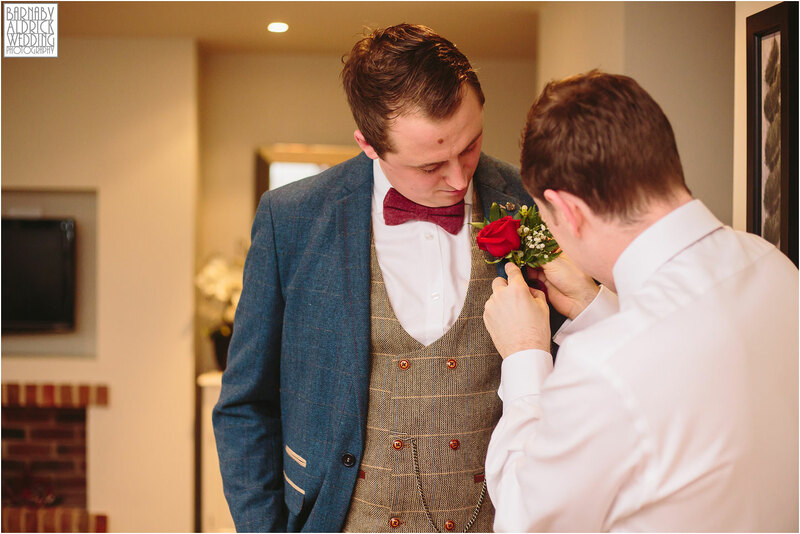 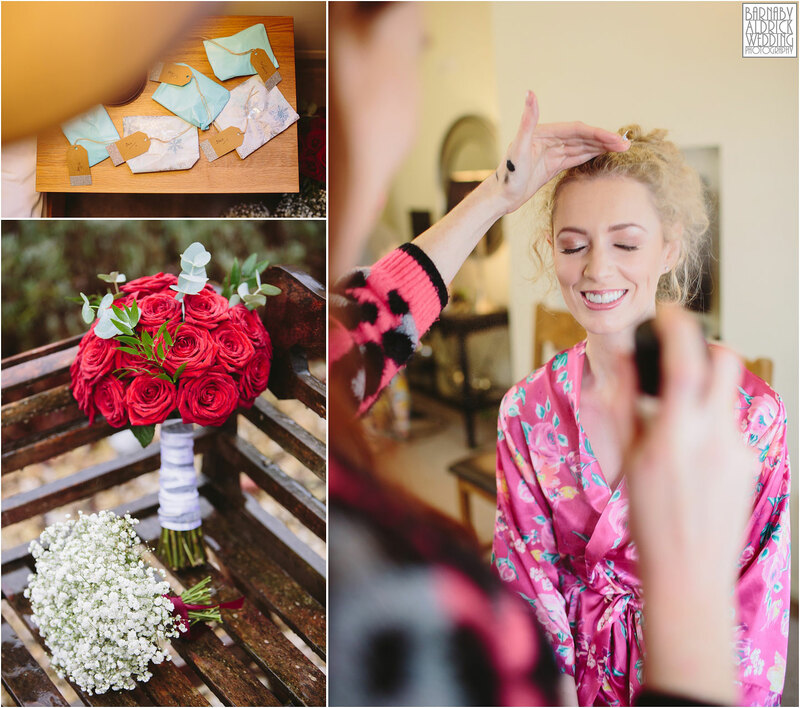 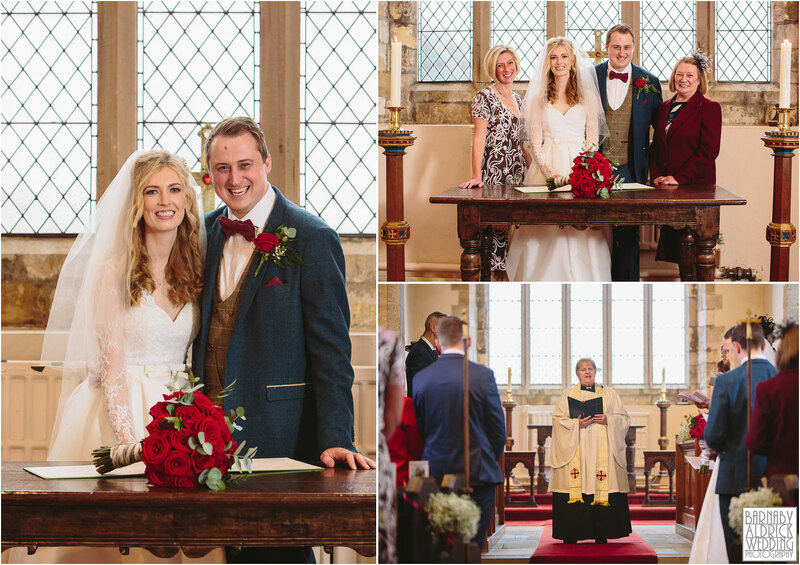 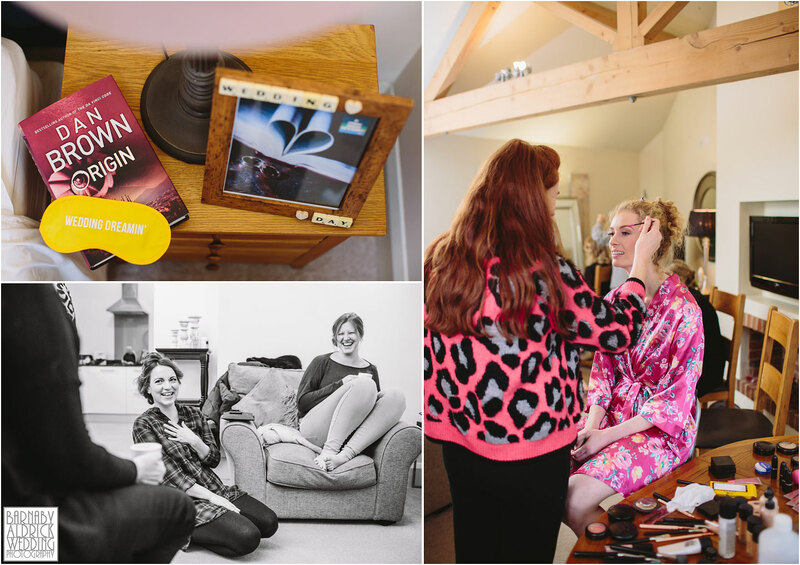 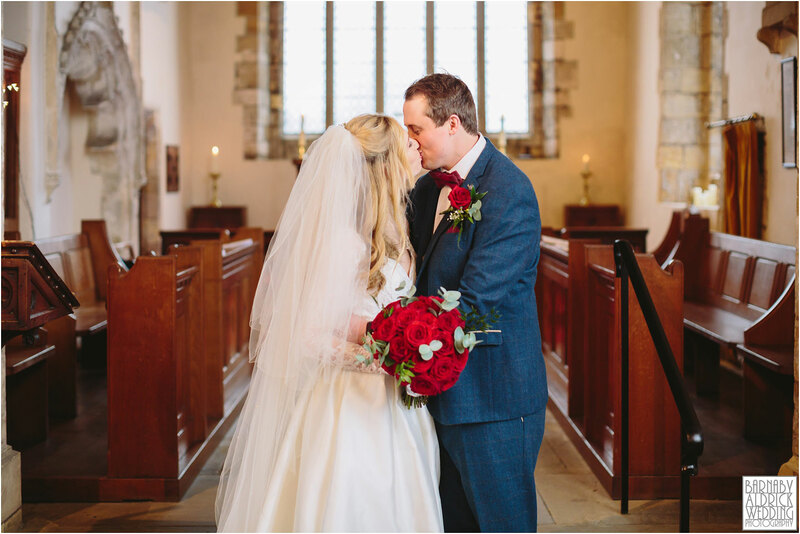 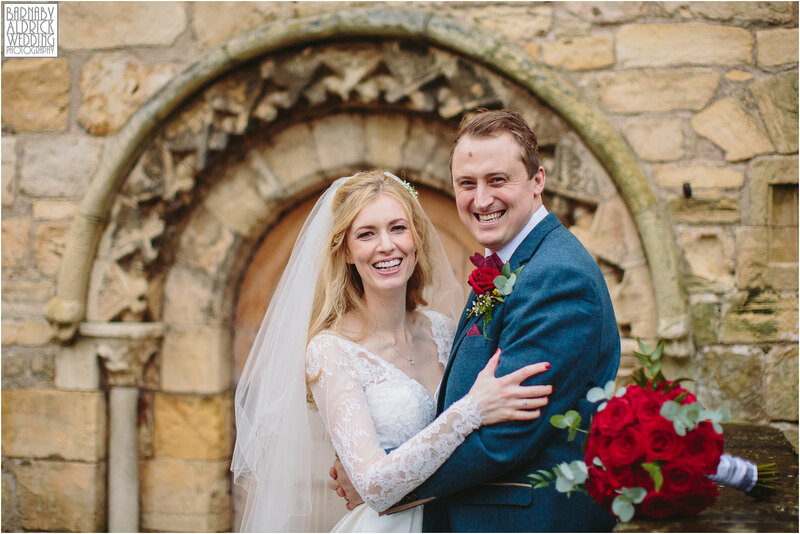 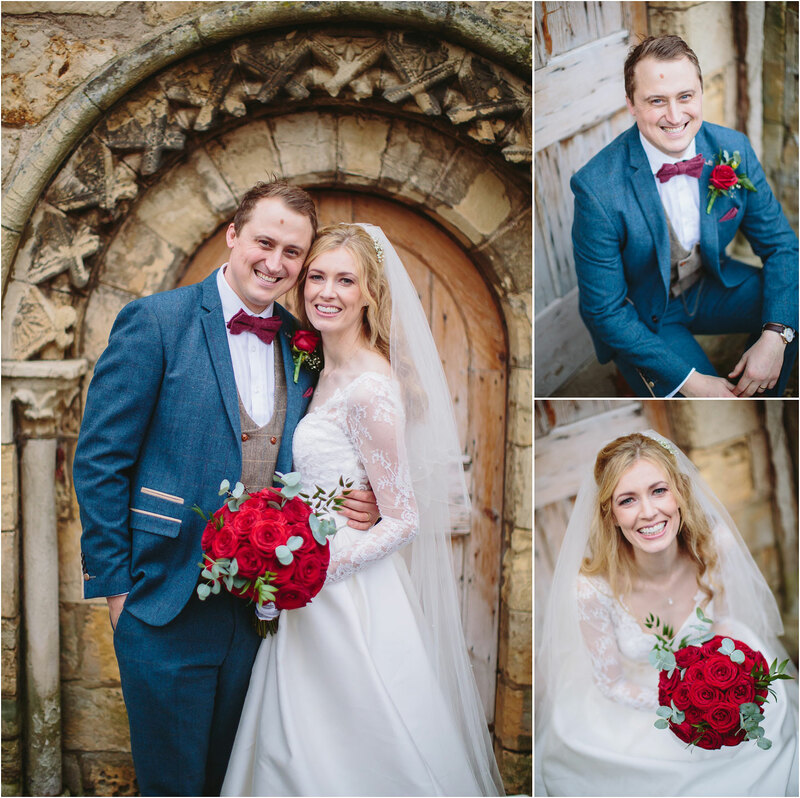 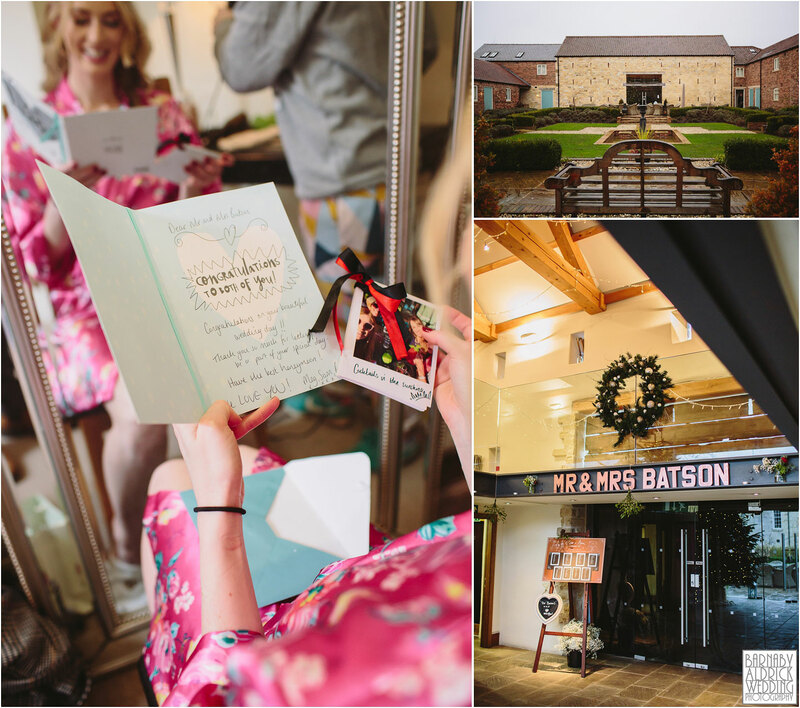 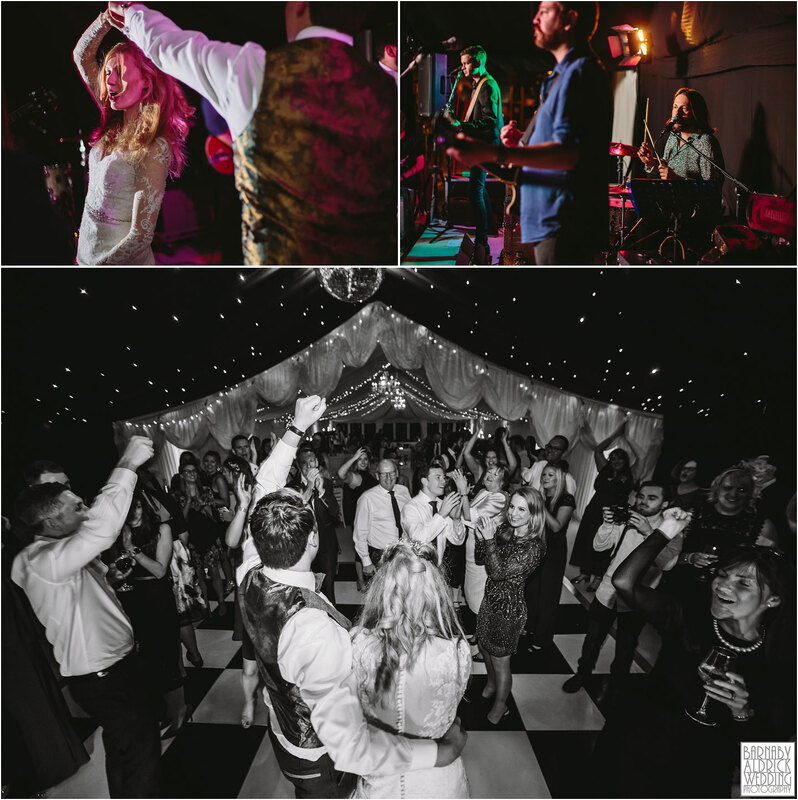 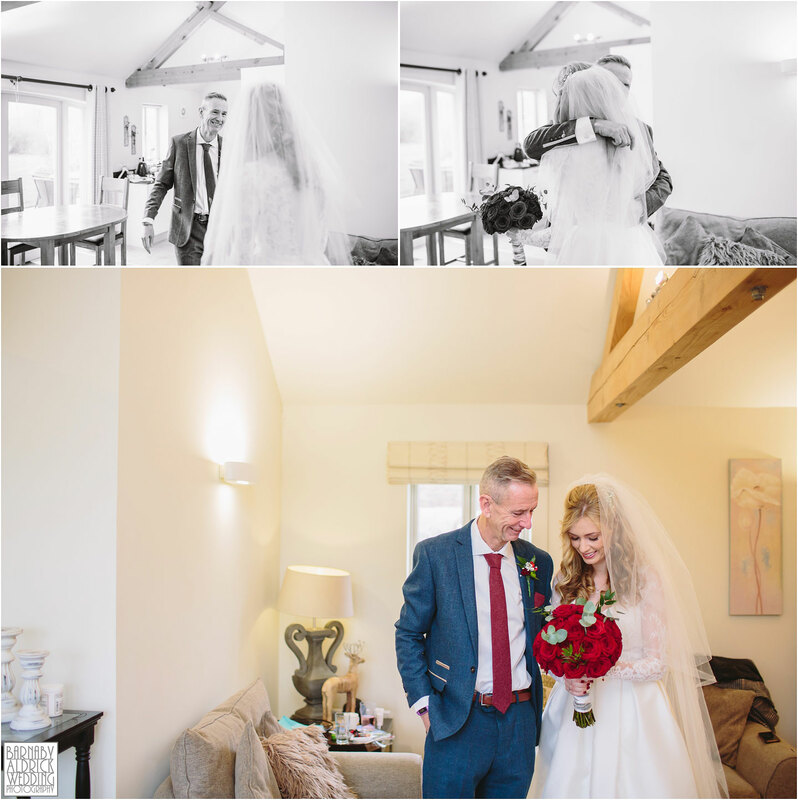 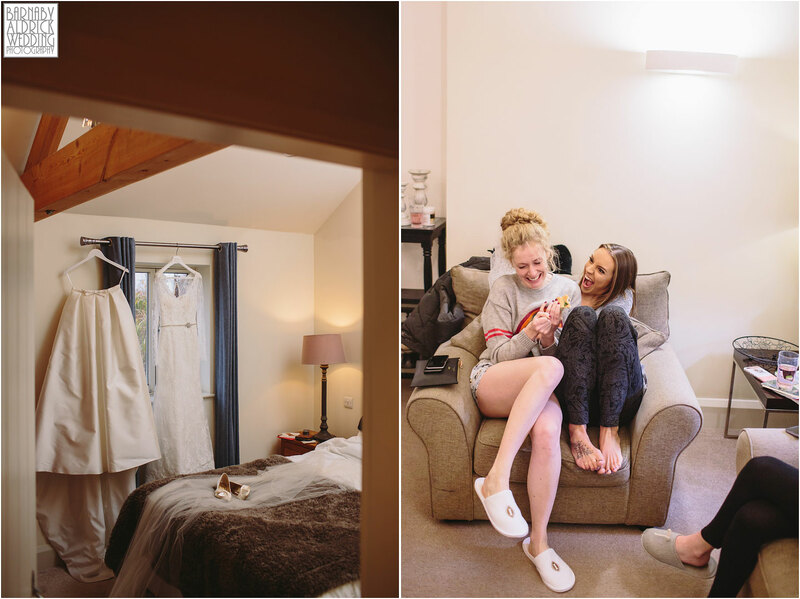 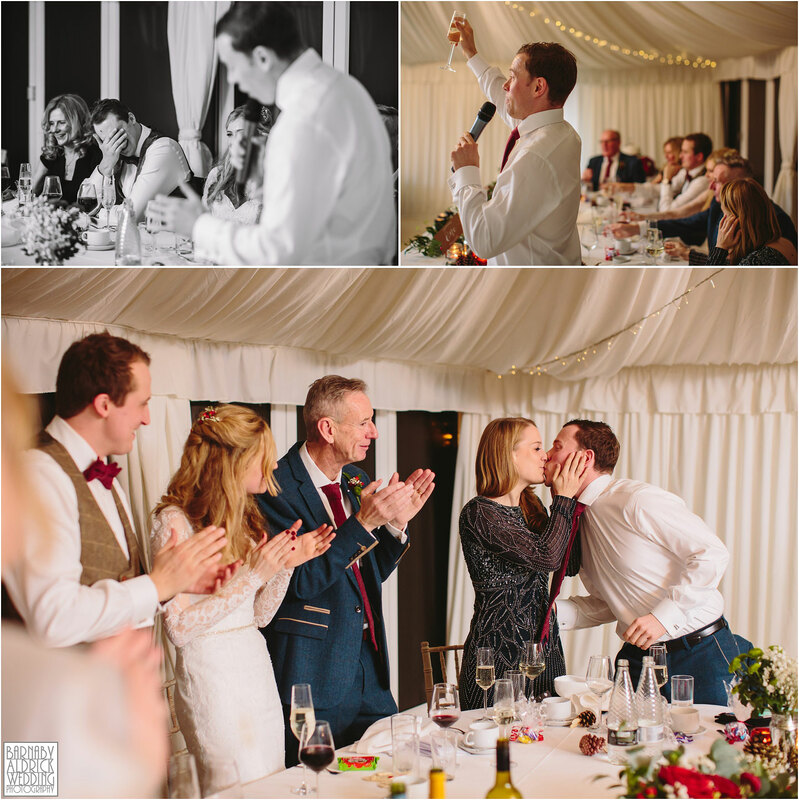 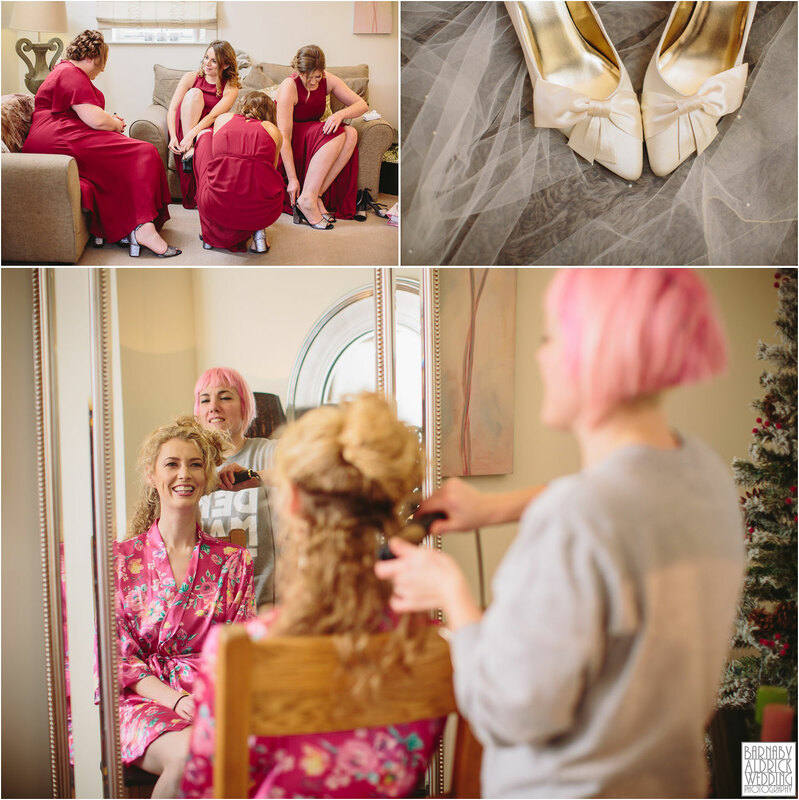 As usual, the shenanigans at were run wonderfully by the team at The Priory, and the day went off without a hitch… But the thing I liked most of all was how fun and relaxed this happy couple are together – Clearly a brilliant pairing!